Wilmington, DE-- The Wilmington Blue Rocks have unveiled plans for this year's Blue Saturday Ticket Extravaganza. The event is slated for February 23 when Individual tickets for the 2019 season will be available beginning at 9 a.m. and the fun continues until 1 p.m. at the Frawley Stadium Box Office. Prices for Opening Night tickets will be dictated by that morning's temperature. 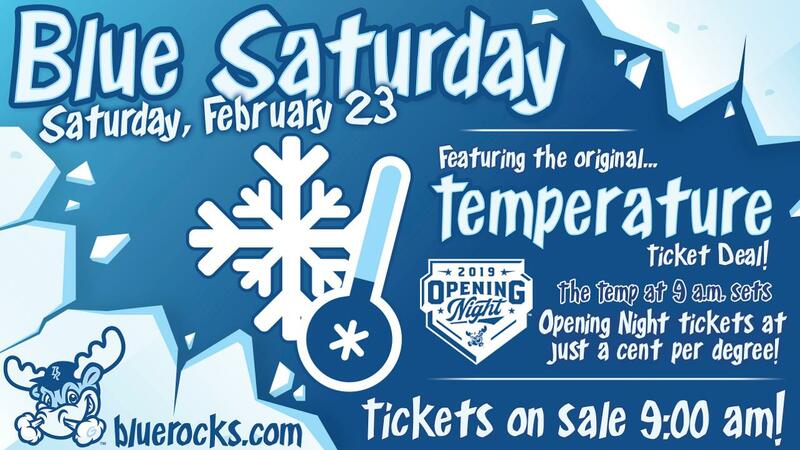 It will be one cent per degree, so if it is 26 degrees at 9 a.m. on February 23, Opening Night tickets during Blue Saturday will be just 26 cents. The team will also offer four-packs of tickets for games on April 9, June 10 and August 20 for just $25. That offer also includes $5 loaded onto each ticket, which can be used for concessions and merchandise. Fans looking to book group hospitality during the 2019 season can grab a "suite" deal on Blue Saturday. For any non-fireworks game during the month of April, fans can book a private suite on the Unique Image Luxury Level for just $200. Those looking to up the ante can purchase an "all-inclusive" suite package with food & beverages included for $550 for any non-fireworks game in April. Both one-day-only deals save fans up to $225 off of regular prices. The team will also offer its just-unveiled BLUE Card membership at Blue Saturday. For just $140 -- or as little as $2 per game -- fans will receive a guaranteed bleacher ticket to all 70 Blue Rocks home games in 2019. The discounts are only part of the fun. There will be appearances by mascot Rocky Bluewinkle as well as a face painter, a prize wheel, free ballpark food, plus complimentary donuts and coffee from Dunkin. Baltimore Crab Cake Co. will be on-hand sampling delicious Maryland crab cakes.Younger fans will be able register for the Junior Blue Rocks kids club and guarantee themselves a ticket to every Sunday home game in 2019. "Our fans love this event and we are incredibly fortunate as an organization that they have made it part of their annual routine," said Blue Rocks director of tickets Joe McCarthy . "Most explained to us how much more convenient a weekend would be so we eagerly adjusted our calendar and moved it from Presidents' Day to Saturday, February 23. We've kept the most popular aspects of the extravaganza and built upon that foundation with new deals and promotions which we are excited for our fans to enjoy. It is going to be a fantastic celebration of baseball's imminent return." The Blue Crew open their 2019 season at home on Thursday, April 4 against the Salem Red Sox. The organization will release its promotional schedule next week. Season seats, mini plans and group packages for the upcoming campaign are available now at BlueRocks.com.